The Blackpool board have accepted responsibility for the club's relegation to League Two and promised a review into how the club is run. A 5-1 defeat at Peterborough in their last game of the season saw the Tangerines drop into the fourth tier. Boss Neil McDonald is unsure if he will be in charge of the club next season. "An urgent board meeting has been called to discuss the club's future and implement plans to halt further decline," said a club statement. "The board takes full responsibility for the position we now find ourselves in. "Mistakes have been made in the last few years and we continue to pay for some of them, whilst learning from others." 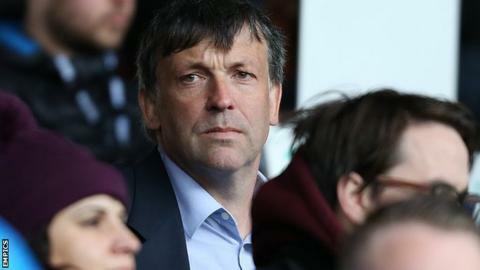 A number of supporters have demonstrated against the way chairman Karl Oyston and his father Owen, who is Blackpool's owner, have run the club in recent seasons. Protests took place outside Bloomfield Road at their final home game of the season against Wigan and continued at Peterborough. After their one-season stay in the Premier League in 2010-11, Blackpool spent three seasons in the Championship, but have now suffered back-to-back relegations. "We understand that the supporters care passionately about the club and want to see it succeed," added the statement. "Fan representation on the board has already been initiated. A democratic process for fan board membership will be implemented for the coming season and it is hoped that the fans will have a large say in shaping future policy. "The board does not underestimate the challenge ahead and will now re-focus its energies to rectify things on the pitch and try to repair some of those off it, whilst sadly accepting that some of the issues may not be curable."